If your family business is growing, it will have a tendency to continue to grow because you’re doing things right. Conversely, a family business that is going backwards or shrinking has a tendency to continue to go backwards or shrink until acted upon by an outside force. All responsible family business managers know that unless the company is growing, it’s showing the first signs of death. 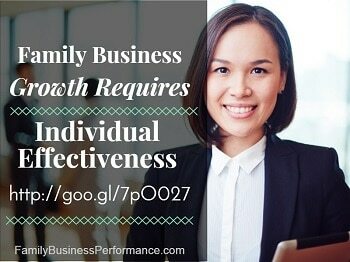 As the head of your family business, you must realize that this applies to you as well. As a family business and a family business leader, you have a tremendous advantage over even the largest corporation. Think of any large multi-national corporation. Can it double its production in a single day? Of course not. Can it double its sales in a single day? Of course not. It might like to, but its growth must be gradual and steady because of the complexities of such a large organization. Yet a person can double, triple, quadruple his/her effectiveness in a month or less. Family businesses have the flexibility, control and responsiveness which corporate giants lack. Can you grow and improve as a family business manager at least 10% a year? Of course you can. In fact, experts estimate a person can increase his or her effectiveness anywhere from 50% to 100% and more within 30 days. Now apply that to your entire family business. I’ve increased readership of my newsletter 300% in the last 60 days. In his Freshman year in college my nephew got a 2.1GPA first semester; but got motivated to study, applied himself, and delivered a 3.6 GPA for second semester. I remember the days in sales when my datebook looked like pure snow (no appointments). Then I accepted a challenge to have 10 appointments on the books every week (most of my peers averaged 3-5 appointments). My previous year’s sales became my monthly sales. History is filled with people who exceeded their previous performance to an almost unbelievable extent (artists, athletes, musicians, military and political leaders, not to mention the corporate rags to riches stories). Think about what that means. If you waste even an hour of productive time every work day, it adds up to 250 hours a year. If you had an employee who wasted that much time, would you keep him on the payroll or fire him? What is your time worth per hour? Multiply this by 250 and you can see what you’re throwing away. The effect is compounded when you tally the cost for each member of your family business team. Whether your business pays for this wasted hour or not, is unimportant. Rather, what can you do now to improve the effectiveness of every member of your family?